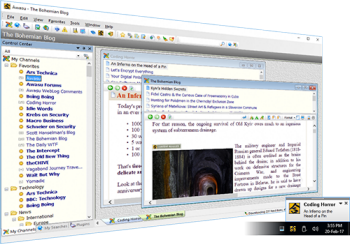 Awasu is a state-of-the-art feed reader that comes loaded with features for both casual personal use and professional, high-powered information management. Find out more below or check out Awasu's unique end-to-end information management features that give you complete control over your information as it moves around the Internet. a modern and fully customizable user interface. advanced features to manage your channels. content archiving, coupled with an advanced search engine. automatically download your favorite podcasts. integrate with your blogging tools. automatically keep your blogroll up-to-date. keep working even when you're not online. actively monitor your feeds for things you're interested in. keep multiple copies of Awasu in sync with each other, and even other feed readers. take information out of Awasu and republish it. Take the tour or check out the detailed feature list for more information. I've been using Awasu Pro daily for a couple of years and continue to think it's excellent/outstanding/superb. Thanks! It's my favorite RSS reader, I absolutely love it and you will too. I love it. I've been recommending it to all of my friends. If you as yet have not had the singular pleasure of dealing with the Awasu people, know that you can expect their support to be every bit as excellent as their product. Awasu and the stylized Japanese character in the orange box are trademarks of Awasu Pty. Ltd. Other brands and product names are trademarks of their respective owners. Awasu Pty. Ltd. believes the information in this publication is accurate as of its publication date. Such information is subject to change without notice. Awasu Pty. Ltd. is not responsible for inadvertent errors.